SONA: Should We Expect an Apology? I, like many of my compatriots, sat aghast, as the State of the Nation Address collapsed in a heap. 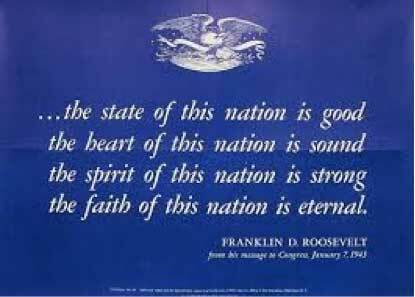 Franklin D. Roosevelt’s words below rang hollow. I sat there mesmerised by what I never thought possible in a country so proud of its constitution, its democratic transition and its re-entry onto the global stage. For many years I was involved in Labour Negotiations, mostly characterised by two (sometimes three or four, if there were rival unions) parties sitting in a room with what seemed intractable differences. Management wanting to contain or reduce costs, Labour wanting to improve their terms and conditions and improve their standard of living. There was little or no ‘common ground’ on the CONTENT issues. Mgt. offering 5%, Labour demanding 25%; Mgt. wanting the use of ‘casuals’ in peak periods, Labour demanding full employment rights for all. The list of ‘demands’ was substantial, sometimes seemingly endless, Mgt. resources always limited, in both ‘good’ and ‘bad’ times. BUT, both parties knew that a legitimate, credible, fair, transparent, ethical, and respectful PROCESS was critical if there was to be any possibility of establishing common ground and reaching agreement. Someone (a Chairperson) needed to focus on the PROCESS only, while the negotiators debated, sometimes harangued, over the CONTENT. And take every reasonable step to protect it (and not the President). Surely being party, either directly or indirectly, to authorising a jamming mechanism is in violation of these principles? Surely arranging for the Public Order Police to be on standby, and then calling on them, is in violation of these principles? Surely “putting the EFF in its place” and “showing the EFF who is boss” is in violation of these principles? Surely our Speaker Baleka Mbete is able to distinguish her role as chairperson of her party (the ANC) from her role as ‘Chairperson’ in the State (as defender of the institution of Parliament)? As Chairperson of the State she is the custodian of parliamentary PROCESS. It is her duty to uphold the dignity of parliament. Good evening, sanibonani, molweni, riperile, dumelang, lotjhani, goeienaand, ndi madekwana, !gai//goes. I would like to thank the Presiding Officers for the opportunity to address the nation this evening. I am fully aware that there are some pressing questions that the Honourable Members of this House wish to ask. I am fully aware that the issues of Eskom, leadership challenges in our parastatals and security agencies, service delivery protests, municipals demarcations, NDP implementation, the role of the Public Protector and the issues surrounding Nkandla are uppermost in the minds of many citizens and the Honourable members here present. To-day I will answer these questions. In return I would appeal to you, as your President to allow me the space to deliver my State of the Nation address uninterrupted. We have a Parliamentary process to respect, we have citizens who are listening to respect, and we have our Country’s reputation to respect. The year 2015 marks 60 years of a historic moment in our history, when South Africans from all walks of life adopted the Freedom Charter in 1955, in Kliptown, Soweto. They declared amongst other things, that South Africa belongs to all who live in it, black and white, and that no government can justly claim authority unless it is based on the will of all the people. That was a powerful, visionary and reconciliatory statement which set the tone for the non-racial democracy we have established…………………………….. If the EFF remained unconvinced and raised ‘A point of order’ our Speaker should have allowed two or three and then stated firmly. 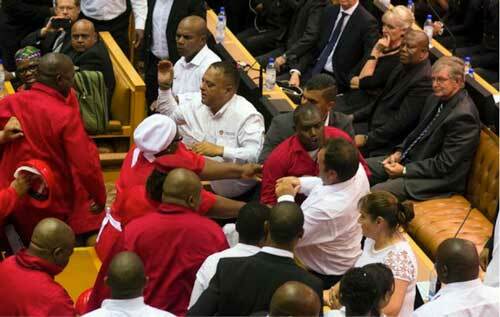 Surely, the cabal of Ministers who were discussing the EFF’s disruptive tactics would have considered this? It seems not, jammers and armed Public Order Police were preferred. The response around the world has been unanimous and unambiguous. “The events that unfolded last week, before, during and after the State of the Nation Address on Thursday evening, will go down in history as a catalytic moment that either helped to break — or build — our democracy. The difference between these two outcomes depends on the lessons South Africans learn from these events, and how the people who really matter in a democracy — the voters — respond to them. The dominant narrative at present — which poses a grave threat to democracy — is that we are witnessing a battle for supremacy and control over Parliamentary proceedings between the ANC and the Economic Freedom Fighters (EFF). “Presumably, and perhaps fatefully, the speaker and her party colleagues decided to confuse means and ends. Parliament and the people who elect it are indeed entitled to demand proper debate and not the one-trick-pony antics of serial disrupters. But when armed heavies, signal jamming and the full apparatus of the PW Botha iron fist are unleashed, then it may be said that they “destroy better than they know”. “I think we would all of us agree that what happened in parliament [on Thursday] was very troubling, my reading of the problem is that the problem is political, and you don’t use administrative instruments to resolve a political problem … If the problem is political, you’re not going to change it by quoting a rule. You’ve got to confront the political problem. (As we went to press this statement has been contested by Mbeki’s spokesperson, the responsible journalist is holding his ground).